A phenomenally comprehensive look at a mostly forgotten cultural underworld that flourished in the 1980s and early 1990s: the world of rough and ready fanzines, often photocopied and stapled together by their creators, focused on horror movies at a time when they were culturally dominant in a way they hadn't been since the heyday of Universal's monsters.Szpunar (occasionally assisted by other interviewers) has done an amazing job in tracking down some of the most important (and even some of the most obscure) editors, writers, and artists who centered around nodes like New York City's infamous grindhouse theaters, Chas. Balun's influential "Deep Red," and the independent horror film scenes that were just transitioning from the drive-in and fleapit circuit to the world of straight-to-video and horror conventions.It's a staggeringly accomplished work of journalism and history, and especially valuable now as some of the most important players in that dimly-remembered world (not so long ago!) have sadly died. So much of what made that scene vibrant and fun is here: the geographic isolation broken by mail-order contact with a legion of fellow fans; the gleeful embrace of transgressive and shocking imagery and language during the grim days of the Reagan-Thatcher era; the championing of forgotten films now regarded as cult classics; the joy of expressing yourself for the first time and learning that others wanted to hear your voice.Appropriately for a work this large, many of the flaws are also present: the "video nasties" controversy in Great Britain, and related scares in Australia, that saw some horror fans becoming uncomfortably acquainted with the police; the backbiting and gossip that occasionally roiled the horror zine scene; the collapse of the entire ecosystem in the 1990s as the horror boom ended and the Internet started to sap people's desire for printed zines.I would have liked to see some more detailed discussion of some of the issues alluded to by a number of interviewees on subjects like the gender imbalance of the scene (nearly everyone interviewed here is a man, which isn't an oversight on Szpunar's part - the scene itself was overwhelmingly white, nerdy, and male) and the occasionally truly troubled people horror scenesters rubbed shoulders with. 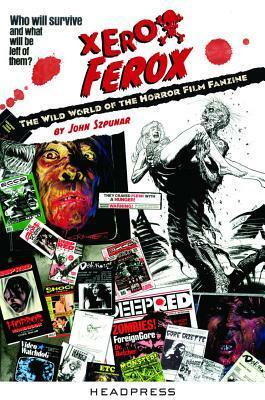 It's also unfortunate that Gore Gazette's Rick Sullivan and Psychotronic's Michael Weldon declined to be interviewed, but that's not a reflection on Szpunar.All in all, this is a must-read book for anyone interested in horror, zines, or an overlooked corner of popular culture at a dynamic and memorable time. Today we have become used to fan-produced media. There is no shortage of blogs and podcasts through which individuals share their enthusiasm for movies, music, books, sport, etc. But before blogs and ebooks and podcasts - before the internet - passionate fandom led some enterprising individuals to create fanzines - home-made magazines sometimes run off on primitive mimeograph machines or photocopied. Often they were given away for the price of postage or swapped for other fan's zines. Some zine publishers would end up getting access to professional printing. A few were even able to have their mags distributed to newsstands.This book documents the horror movie fanzine phenomena through interviews with those who created or wrote for many of the most famous or influential zines. The fanzines, like their creators, varied greatly. Some were purely horror related. Others also covered non-horror themed exploitation movies. In depth critiques and interviews were the meat of some of the mags, while others entertained with their sick humour and punk attitude. Illustrations would range from ad mats cut out of the newspaper to remarkable works of comic book art by the likes of Steve Bissette.I haven't read many fanzines, but I was a big fan of Michael Weldon's Psychotronic Video during its relatively brief existence. And I bought a couple of issues of some of the other famous fanzines. But you don't have to have been a major part of that scene to find this book compelling reading. If you are a fan of horror movies you will probably be able to relate to the experiences of these fellow fans. And the interviews are full of crazy anecdotes. Also, you will find here inspiring tales of people who had a vision of what could be and made it real. Fans' access to information didn't need to be mass-mediated. Professional film reviewers might just not "get it" and the publicity department of a movie company wasn't going to tell you their movie sucked. For some, the zines were the first step toward making their own movies.Perhaps we don't always appreciate the ease with which we can access movies today. I'd rather live now where I can easily buy obscure horror movies in widescreen on DVD or BluRay, to the days when tape traders who wanted to see a notorious movie would have to make do with a blurry fifth generation copy of a censored pan and scan VHS. And I definitely wouldn't have wanted to live in England during the period when the police could raid your home if they suspected you had a copy of Cannibal Holocaust. I also don't think I would have wanted to go to see the exploitation movies I love in a New York 42nd Street cinema full of pimps and pushers. But it is fun to experience these things vicariously in these interviews.Generous samples of artwork and page layouts from the zines illustrate the book. The fact that the interviews themselves feature rather a lot of typos seems almost appropriate to the subject matter.At 800 pages you certainly get your money's worth, and a thorough overview of a fascinating subculture, which is not just a thing of the past. Some of the zines are still in operation. After you've read this book I think you'll be inspired to take a break from reading film blogs occasionally in favour of something with staples in it. Xerox Ferox is a mammoth book. Nearly 800 pages dedicated to horror fanzines, 40 fanzine creators interviewed at length about their zine and the overall history of monster zines. Normally when I review a book, I wait until I’m done reading it. Given this book’s encyclopedic coverage of the subject, I’ll be chewing on it for a while and I don’t want to wait to spread the good news to you dear readers. This book is colossal, killer, and crucial to own if you care at all about underground publication. What you won’t find are interviews with Fangoria, Rue Morgue, or Famous Monsters Alum. No Gorezone, no Starlog, no SFX. None of the big names are here and I’m glad. I don’t need to know more about them and if I did, I could look elsewhere. This book is dedicated to zines run more or less by a single person, a person with a passion and a need to write about cult/horror films, not a need to make their living off of it. This is a true tome dedicated to the DIY spirit of self publishing. It’s informative, fun, and inspiring. The layout is great too. It’s basically just a series of interviews, straight dope from the horses mouth. The book is filled with great grungy photos of zines and films which helps create a cut-n-paste vibe which really works here. This is a book several years in the making and it shows in the best way possible. The book really is food for my soul. It’s so nice to read about kindred spirits, loving film and putting it out there for everyone to see. I’ve been trying to get my own print zine off of the ground for a couple of years now and after reading this the candle has been relit.To echo what i’ve already said on my Bleeding Skull review, I’m really glad that Headpress is here and is releasing high quality books like this. And again this book is a must own for anyone interested in the history and passion of print zines. Hopefully there will be expanded versions in the future including current zines like Lunchmeat, Crimson Screens,Weng’s Chop, and Paracinema who are still keeping print alive. I loved this book. It brought back a lot of good memories of reading fanzines and searching high and low for such films as Cannibal Holocaust, Men Behind the Sun, In a Glass Cage and countless others.